Trust Contract – Get this list of good business qualities to help your team visualize and promise to keep the characteristics of a good team member. 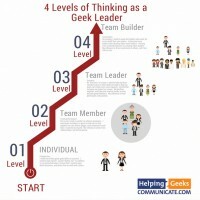 The 4 Levels of Thinking as a Geek Leader graphic* – This document explains the details of each level and helps you find which level you currently belong to. *Updated from last episode. Man: Becoming a Geek Leader. Season two. Episode one. Man: [00:00:07] Have you ever had one of those really annoying customers who always seems to be looking to start an argument? Have you ever had a team member who just couldn’t let go and delegate work, but was always complaining about being buried? I’ve been there and I know how frustrating that can feel. I also know these things don’t generally get better on their own. People need help learning exactly how to communicate, delegate, manage conflict with others, and plan more effectively. [00:00:38] Now, you know it would be great if you had a simple plan to address those needs, but you’re crazy busy too, right? That’s why I created the Geek to Great 101 program. It’s a simple system designed for you to take a portion of your already scheduled team meetings to play a video for your team, ask a few questions from the Leader’s Guide, and your team members will be able to fill in their own personalized action plan. It’s a great way to put a simple professional development program in place. Your team members will be able to share their plan with you, and you can help them actually do it. [00:01:14] Train your whole team for less than $500. Find out more information and get immediate access to your first free lesson at brighthillgroup.com/helpinggeeks. That’s brighthillgroup.com/helpinggeeks. Tom: [00:01:33] Welcome to the Becoming a Geek Leader podcast. My name is Tom Cooper. As a geek, I’m on a mission to figure out better ways to lead others at work and at home. Through the Becoming a Geek Leader podcast, I’m sharing what I’m learning so I can help make you more effective at leading people too. Ready? [00:01:55] Welcome to season two. I can’t believe I’m here already. It seems like season one just flew right by and I’m excited about what we’ve got in store for you for season two. In season one episode ten, I introduced the four levels of thinking as a geek leader. Now, in season two, you can look forward to even more action-oriented ideas about how to be more effective in getting people to want to help you. We’re still gonna have the segments you’ve enjoyed before, and now I’ll also be tying the ideas and answers to the Coach’s Mailbox questions to the level of thinking that you need for that answer. [00:02:36] Now, in today’s episode, just in case you missed out on the season finale of season one, I’m gonna be briefly reviewing the four levels of leadership that you need as a geek leader. And then we’ll talk about how to develop a team culture even if your company already has a culture. And especially if that culture is, well, not great. In the Coach’s Mailbox segment, I’m gonna talk about how do you deal with a team member who is incredibly self-absorbed. And then finally, we’ll wrap up with a family segment on the importance of prototyping to get great design and great results. [00:03:16] Also, don’t forget that you can download from the website a one-pager with the four levels of thinking as a geek leader. And I want to encourage you to get your copy. But right now, let’s jump right into that reminder about exactly what the four levels of thinking are. Man: [00:03:34] The four levels of thinking as a geek leader. Level one. Individual. At level one, you may even be a superstar technical resource. Level one focuses you on improving your technical skills. [00:03:51] Level two. Team member. Level two is where you work well with others, and together you all succeed. [00:04:00] Level three. Team leader. Level three. As the boss of a team, your job is to recruit and develop individuals and team members who follow your lead. [00:04:14] Level four. Team builder. At level four, you’re developing team members and team leaders who will take over and grow their own teams as they become great leaders themselves. Tom: [00:04:29] In the mentoring segment today, I want to talk about creating a culture for your team. Now, this segment is focused on thinking at level three, the team leader level. 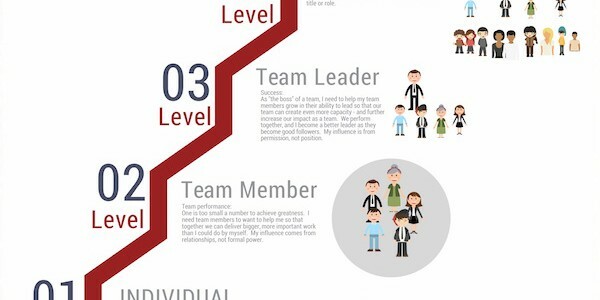 But I want to point out if you’re a team member, if you’re level two, your job is going to be embracing the culture that your leader sets and participating there. But as we dive into this content, think about level three. Tom: [00:05:33] I remember back in the day I was working for a Fortune 500 company. I was in the IT department and we were so big that our people had people. We were bureaucratic. We were stovepiped. We were incredibly inefficient. Each department was responsible for a specific set of work. Other departments were responsible for a different set of work. Heaven help you if the work you needed crossed the departmental boundary because nobody wanted to step into the gap. [00:06:03] When I became a formal leader, I stepped in to lead a team in that type of environment. It was my team’s job to build interfaces that would integrate enterprise systems. That meant our purpose was to fill the gaps between systems. The problem is there were far too many gaps for my team to be able to handle them all. Our project list was a mile long and our team capacity was not huge. Our operational responsibilities, just the day-to-day keeping-the-crank-turning stuff, consumed a majority of my team’s availability. It was a mess. [00:06:41] In addition, at the time I stepped in, our team had been struggling with a leader who was frankly a little over his head. He had a great deal of challenges in his personal life that were effecting his sleep and his capacity at work. And for a long time, he was literally falling asleep in meetings. He focused on low-priority items and he frustrated his peers and his leaders. [00:07:01] Now, when I took over, I had a small team of just a few people. How in the world was I going to establish a team culture in the face of a corporate machine that was optimized for no one? I didn’t have the formal authority to do much of anything. In fact, I used to say the default rule was unless you were explicitly granted permission to do anything, the answer was no. Don’t do it. [00:07:27] However, in the face of opposition, I was able to build and train a team where I wooed multiple people to take significant pay cuts to join my team. Now, that’s not because I was chintzy. It’s because the corporate pay structure was so poor they paid far under market, and in order for me to recruit the right people I had to talk people into being willing to work for less money. [00:07:49] The thing is they loved working with each other in spite of the fact that they had given up some income to join the team. One of them said to me, “Truly you have changed my life.” Years after I left, one of them said to me, “Tom, when you left, the magic left.” Now, here’s the thing, I am not magic and I didn’t have amazing powers. So what did I do? [00:08:15] And an interaction that is as unique to your team that augments the corporate culture…because the company I worked for actually didn’t have horrible corporate culture, but it had a number of things that caused people’s behaviors to be antisocial. So what we did was we built a culture that really was interdependent for our team. Our city within a city had a different set of standards than the rest of the organization had. [00:08:41] One of the first things I did was I said out loud what those standards would be. I didn’t have them this well-organized at the time, but they fell into the following categories. There were three of them. One, “We’re going to look out for each other.” Two, “As your boss, I will always have your back.” And three, “Our team will aspire to be excellent in the work that we do.” We look out for each other, I will always have your back as your boss, and our team will aspire to excellence in the work that we do. [00:09:17] Let me start with looking out for each other. I told people that my expectation was that we were going to be a team. We were going to work together. We were going to help each other out. That meant we were going to make sure that the needs of the team were covered, rather than just my interests being covered. [00:09:34] For example, I would literally say to my team, “I have lots of stupid ideas. I know that. And when we’re working out how to solve a problem, how to figure out how to do something, if you think my idea is idiotic, tell me. I will hear you out. We will go for unanimous agreement. That’s the best possible situation. If we can get everybody on the same page, that is the ideal situation. [00:11:04] If a team member was having some challenges in their personal life, we were going to find a way to cover for them. We’re going to make it possible for them to focus on the important non-work stuff. Because we weren’t a group of people who were individual contributors, we were a team. We were going to work as a team. We were going to win as a team. We were going to lose as a team. Period. [00:11:26] The last section that I want to talk about here, under looking out for each other, is we would look for opportunities to be positive. Not only would we skip out on public criticism of a team member, we’d also intentionally, specifically, proactively look for ways to catch each other doing something good. And we would be intentional about noticing and giving credit to somebody else rather than looking out for ourselves. [00:11:56] The goal was to set an example of saying good things about each other. Now, I will tell you that one little thing makes a big difference in team interaction. And why? Because it’s so rare. So much of the time, so many of us are looking out for our own interest and trying to find a way to tell everybody how great we are, that when somebody says, “Hey, I think Sally did a fantastic job,” it stands out because it’s just not done. [00:12:26] Okay. So that’s looking out for each other. Now let me talk about, “As your boss I will always have your back.” I saw my job as a team leader to make sure team members had everything they needed to be successful. It was my job to do everything I could do to anticipate the problems they were going to run into and remove impediments from my team. I could only be successful if they were successful. [00:12:51] When they dropped the ball, and it did happen, I never threw them under the bus. My job was to protect my team members. I’d share credit, even publicly praising my team members to my boss. When the boss would say, “Hey, Tom, good job on getting the system implemented,” I would say, “You know, I really couldn’t have done it without Desai. He was all over that thing. He took care of it. And Otto was the man who was checking out the details and making sure we got all that stuff right.” I wasn’t looking for opportunities to build myself up. I was looking for opportunities to build up my team members. [00:13:28] Now, sometimes it happened where a team member made a decision that was really, I mean, even indefensible. They just made a bad choice. Everybody does that sometimes and nobody wants to get thrown under the bus in that situation. [00:13:42] So I’m in a meeting and a customer is really unhappy and one of the guys on my team had really blown it. Rather than saying, “I’m going to talk to so and so. I can’t believe he made that decision,” I would say, “That’s a decision we made.” I wouldn’t say, “John did what? That’s crazy. Why would John…I’ll take care of this.” That doesn’t help John. [00:14:03] Remember, I said we were gonna say positive things in public. Now, if it was obviously wrong, and sometimes it was, again, I would say, “That’ a decision we made. If we need to revisit it, we can do that. Let me go talk to the team and see what we can come up with.” See, we win as a team, we lose as a team. I made a commitment that in private our team would be transparent and in public we were going to back each other up. And I’ll tell you, that a big difference. [00:14:33] So we talked about looking out for each other and how the boss needs to have the team member’s back. Let’s talk about our team aspiring to be excellent in the work that we do. Here’s the thing, most technical experts have made their careers, you’ve probably made your career, on the back of your technical skills. I told the team members we would aspire to be excellent in our technical work. Of course we would. That’s necessary. We got to do that, but it’s not sufficient. It’s not enough. We needed to be excellent in technical skills and have business skills and have people skills. [00:15:10] Now, I challenged my team, when it comes to professional development, to think about two additional specific areas. I told them I was going to measure their success differently than they’d ever been measured before. Of course you’re going to do well in technical skills. We’re a team of technical experts. But I also expected them to grow their skills in dealing with people and in understanding and communicating the language of our business customers. [00:15:43] So my job is to be the chief cheerleader. My job is to help team members grow. But nothing happens without a plan. So the first challenged area that I laid out was they needed to be technical experts, and deal with people, and communicate in the language of our business customers. And then also they needed to have a plan. I challenged my team members to create a professional development plan that was gonna help them grow technically, in business skills, and in people skills. [00:16:16] Now look, not everybody is cut out to be the front person, the lead team member, the one who’s out in front, or the one who’s leading meetings. That’s okay. I wasn’t expecting the team members to become like used car salesmen with a plaid jacket and a loud tie standing up in front of the room, rah rah rah. That’s not it at all. I was challenging them to not be the guy that was so difficult to work with that nobody wanted to work with them. They had to be okay at those kinds of things. [00:16:45] So those are the three areas that we talked about. “We’re gonna look out for each other,” “I will always have your back,” and, “Our team will aspire to excellence.” Now, I made lots of mistakes as a leader, but we learned together and we grew together. And we trusted each other. We supported each other. We created that city within the city, a culture within a larger corporate culture. [00:17:08] Now, the key thing here is culture is the idea that we can trust each other. We can predict what the team is going to do and we’re going to look out for each other, to have each other’s back. One of my mentors is a man by the name of Scott Fay, and Scott has a skill in fixing things that are broken. He comes into organizations and teams and he identifies where the problems are, and he finds ways to fix things. Tom: [00:18:45] This next question really is targeted at level three, but it’s important to note that the self-absorbed team member is probably operating at level one, and you’re going to ask that team member to step up from level one to level two. So let me remind you what level two is. Man: [00:19:04] Level two. Team member. Level two is where you work well with others and together you all succeed. [00:20:01] Wow. This is a common question, as I mentioned, and my clients do run into this all the time. The other day, I came across a quote from Neil deGrasse Tyson. He said “In science, when human behavior enters the equation, things go nonlinear. That’s why physics is easy and sociology is hard.” You know, we’re responsible for being sociologists as leaders. It’s something that we probably don’t talk about enough, or don’t talk about at all. [00:20:32] But the fact is that when you think about something going nonlinear, that’s right. The most predictable thing about people is that people are unpredictable. We like to think of ourselves as engineers who are rational creatures, but the fact is we are emotional creatures who come up with a rational justification for whatever decision we make. [00:20:55] Most of us are so comfortable in the rational, quantifiable space we might not even realize that we are making decisions emotionally and then coming up with a rational justification. When it comes to self-awareness, what you’re really talking about is the question of empathy. And I’ll tell you that sometimes we don’t realize how important empathy is to our relationships and to our success. [00:21:20] As technology folks, sometimes we feel like the best technical solution is all that matters and we focus on that. We don’t even realize what’s happening. So Ian, one question I might be inclined to ask Joe is this. Joe, I’m curious. If what you sincerely believed about working with your team was wrong, would you want to know? [00:21:45] See, the problem is that Joe believes that his way is the best way, and he’s been successful in his career so far as an individual contributor relying on his training, and his thinking, and his judgment, and his work ethic. And all those things have combined to lead to his success. I see this all the time. This approach, my way, has worked so well for so long that sometimes we believe this is all that we need to do to be successful. But as you know, technical skill is necessary but not sufficient. It takes more than excellent engineering to be an engineering leader. [00:22:24] I might say, “Joe, we all know engineers who love the technical work and who bristle at working in a team or interacting directly with customers.” My question for you is, is it your goal? Do you want to be one of those engineers, or do you want your work to impact more people? I’d probably go on to say what you believe about technical acumen being all you need for success is just not true. [00:22:48] Now, I’m curious, is that something you’d like to work on? My guess is that, for Joe, he’s never taken the time to think about that. He’s been frustrated perhaps with his lack of cooperation from team members, and he has had success when he’s taken on the work. We have expressions like, “Well, if you want something done right, you have to do it yourself.” And that’s because we haven’t set the expectations appropriately. We haven’t managed the team members appropriately. We haven’t fought through and communicated what it is we need. [00:23:25] And one of the challenges we have is that we sort of expect that whatever communication mode I prefer is correct and everybody else is weird. And so the challenge is when you think differently than I do, when you communicate differently than I do, then I think that you’re broken. [00:23:43] There’s a tool I like to use when I’m working with teams. It’s called the DISC Assessment; D-I-S-C. DISC provides an easy-to-understand model of how you prefer to communicate and interact with others. Many times, with folks like Joe, just understanding that not everyone thinks like me and not everyone communicates like me and that’s okay, just that idea can be a big breakthrough for my clients. DISC is one of those assessments that breaks people into four quadrants. That means that 25% of the population thinks like you, communicates like you, but 75% doesn’t. And that’s okay. [00:24:21] And a lot of times, just having that understanding that people are different, and different is not wrong can be a huge help to my clients. And once we understand that people are different from us and that’s okay, we can work on understanding what it is that they want, what it is they need, and we can adapt our communications and adapt our style to what they prefer. And that can be a massive help to effectiveness. It can transform the way the team interacts. [00:24:48] So let me give you an example. Are you a task-focused, bottom-line, high-speed performer? Or maybe you’re a facts-focused, get-the-details-right expert. See, those are just two of the four options. And you can see easily how a focus on moving fast might come into conflict with taking the time to get the details right. [00:25:09] See, if I value speed and you value quality and I give you a fast answer that’s wrong, you’re probably not going to be too happy with me. If you think that you need to write a 7-paragraph email with a 10-page attachment, and you’re communicating with a bottom-line, high-speed, task-focused person, you’re both gonna be frustrated. [00:25:29] DISC assessments are inexpensive. They can give you great insights about you and your team. My clients find that when they’re teams begin to understand this model of communication and the way they interact, that their team communication improves and their understanding of others improves, and team members are much more effective in working with each other. [00:25:47] So, my key takeaway for you, Ian, is that the first step is to introduce your idea that not everyone thinks and acts like he does. Different is not wrong. And not only is different not wrong, but diversity of background, diversity of thought, diversity of approach and opinion can lead to far, far more elegant technical solutions. [00:26:10] A challenge we run into is the process is a little messy and is probably going to fall outside Joe’s comfort zone. But if he really wants to deliver great technical work, he’s gonna have to grow beyond delivering all the work himself and really get the best possible performance from others. And that’s today’s Coach’s Mailbox segment. Tom: [00:26:48] During today’s family segment, I’m talking about prototyping. Now, this skill is appropriate for all levels of thinking as a geek leader, but it’s most applicable at level one. Man: [00:26:59] Level one. Individual. At level one, you may even be a superstar technical resource. Level one focuses you on improving your technical skills. Tom: [00:27:14] Now, one of the things that I love about having a wife who loves learning and teaching as much as I do is that we home-school our kids. Now, homeschooling is not for everybody, but it really works for our family and it fits the needs of our kids. One of the things that we do is we participate in a co-op where we get together with other homeschooling families and we work on classes and activities. And one of my boys is working on a group project right now. [00:27:39] In their History class, they’re studying Vikings and the teachers assign them to come up with a project that reflects that time period. My son and three other teen boys, they’re in a group together, and they decided to make Viking weapons. I mean, they’re boys after all, right? We decided we were gonna help them out by setting them up in the workshop to begin to work on creating those tools. [00:28:05] I’ve been supervising the boys in the woodshop as they design, manufacture, and assemble those weapons. This has been a massive learning experience for them, and I gotta tell you, it has been a blast watching them work on problem-solving. But it’s not the most efficient approach, because they wanna jump right in and work on the cool stuff. [00:28:23] They’re learning that making a plan and prototyping actually can save them a ton of time. If you start out with a really hard design idea and you don’t prototype, boy can you waste a lot of materials. That process of creating a smaller scale or even full-size items out of easier-to-work-with materials has helped them think about how to simplify their design, how to choose different materials, how to work as a team to figure it out. [00:28:51] For example, they decided they were going to do an axe and they thought it’d be really cool to have a curved axe blade with a beveled edge. Now, that seems like a great idea, until you start thinking about now exactly what type of tools do you use to cut a curve? And when you cut the curve, how do you do a beveled edge to make it sharp? Now, it was a beautiful design, but it was really complex, and so they started, and I challenged them to start by sketching out their ideas and then create a sample from some MDFs, some cheap disposable materials. [00:29:25] And that gave them an opportunity to learn what their tools could do and what the tools couldn’t do. And when they recognized how much time and effort it was going to take to make the number of cuts they were going to need to make and the amount of finish work it was going to take, they decided to go for a simpler solution. Which brings me to the point of this segment. What are you working on right now that could benefit from a prototype? [00:29:49] I remember I used to send my developers to client meetings and I would tell them to stop by the printer and pull some blank paper out of the printer and take a pencil to draw out the screens rather than do an HTML wireframe. In that process, we learned a ton about business process and actual customer needs as we drew it out together. We walked through the problem together. So let me ask you, what could you draw out as a team? What lessons might you be able to learn more quickly, and how might that affect your design? And that’s today’s family segment. Tom: [00:30:48] In today’s episode, we’ve covered three big ideas. One, how do you create a team culture that might be different from your company’s culture? Two, what do you do when you have a team member who has low self-awareness? And three, how could prototyping or whiteboarding help you learn faster and speed up your delivery? For today’s episode hack, I wanna jump back and focus on the one idea about building trust on your team. [00:31:19] Is there somebody on your team who would benefit from increasing trust with you? What would it take to make a difference with that person? Is it follow-up? Maybe following through and doing exactly what you said you were going to do. Is it speaking up to address an issue? Or maybe is it shutting up and stopping complaining? Is it taking initiative, or is it giving room for other people to take initiative? [00:31:49] What specific step can you take to adapt your style to meet the need that they have? That is going to help you build some trust. For more ideas about building trust, I want you to go to the website and check out the sample trust contract on the resource page and ask yourself if you’re doing the things that are needed for you to be trustworthy. If you find a gap, I wanna encourage you to close that gap. And that’s today’s episode hack. [00:32:19] Is the podcast helping you? Make sure you don’t miss out on the latest info. Head over right now to brighthillgroup.com/join to be sure that you stay in the loop. When you do, you get my PDF, become a geek leader in two easy steps, and you’ll be notified as soon as new podcast episodes are available. Plus, you’ll get updates and ideas that I don’t share on the podcast. Head over to brighthillgroup/join right now. [00:32:52] This is Tom Cooper. Thanks for listening. Be sure to join me next time for another episode of Becoming a Geek Leader. Join me in my mission of discovering better ways to lead others at work and at home.